Join the Hershey’s Characters for some dancing, fun and entertainment! 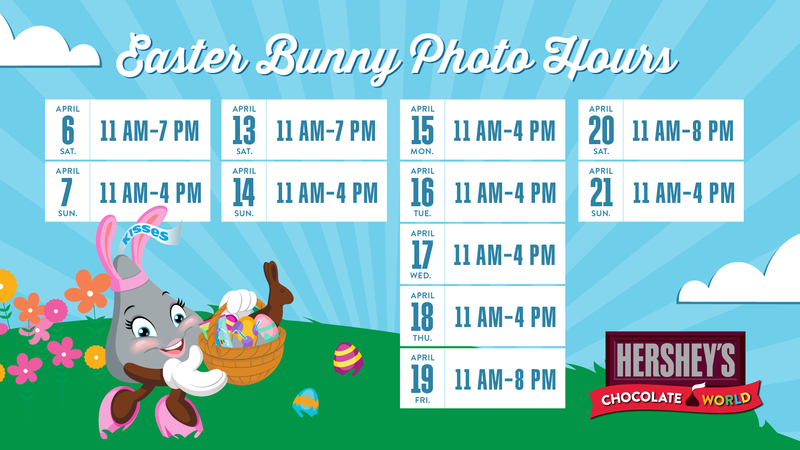 Gather your family to capture a sweet memory with the bunny himself. Chocolate World has everything you need to build the best Easter basket, from Hershey’s Chocolate bunnies and Reese’s Peanut Butter eggs to Jolly Rancher jelly beans and the new Cadbury Shimmer Mini Eggs. Beyond candy, there are also Hershey’s Kisses Easter Socks and a wide selection of unique lip balms, toys, keychains, apparel, and much more! Bunnies, nests, flowers, chicks galore…this season’s adorable and delicious cupcakes speak for themselves! The Bakery team has also cooked up Spring varieties of many other goodies, from bunny sprinkle cookies to candy apples. And for a unique basket treat, there are always ever-popular chocolate-covered goodies like marshmallows, popcorn, graham crackers, and yes, even bacon!